The new scenarios are all optional. None of them directly affect the main plot, and several of them anticipate using pre-generated characters unrelated to the ones in the main campaign. 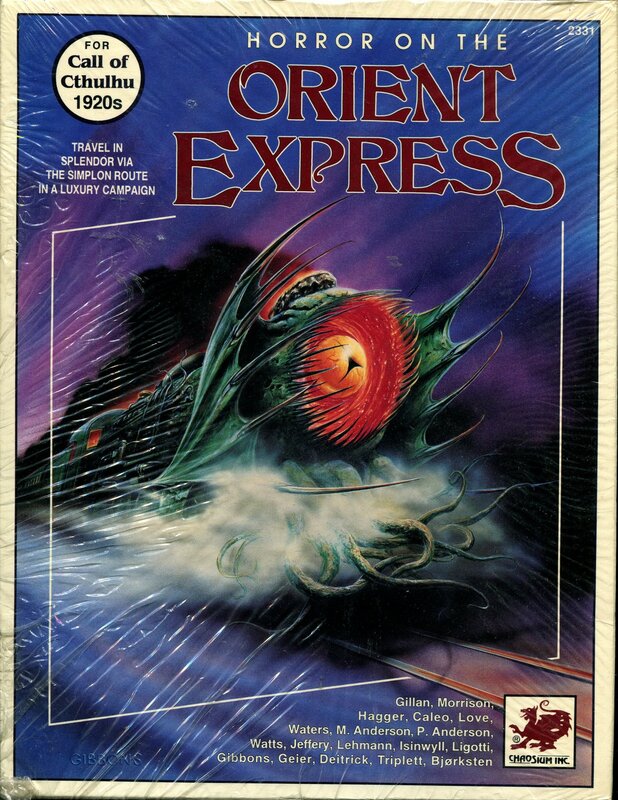 There are flashbacks to Professor Smith's first adventure on the Victorian Orient Express, flashbacks to Constantinople in the First Crusade when the Simalcrum was created, flashbacks to Constantinople in 330 AD when one of the campaign's major antagonists first appears, a Dreamlands scenario set on alternate Orient Express, and one extra scenario set during the events of the main campaign. There's also a modern day scenario, as an added bonus for those who just can't get enough. They're all lots of fun, with the exception of the modern day scenario, which falls flat. Maybe it's not the scenario's fault, but after countless hours of crazy, facing off against everything from animate piles of human skin to raging chickens from Hell, the events of The Simalcrum Unbound feel remarkably tame by comparison. The Dreamlands Express is another problem scenario, but not for the same reason. It's brilliantly written, don't get me wrong, but imagine what would happen if, during Murder on the Orient Express, just at the point where Hercule Poirot sees the corpse for the first time, someone splices in My Neighbor Totoro right when the catbus turns up. It's a complete tonal shift, with almost no relevance to the main plot, and it doesn't help that, although there are several other OE scenarios set on the train that reference the Dreamlands, the Dreamlands Express doesn't turn up again. The Keeper will need to do some work to integrate this one; it can be done, and will probably pay off big time since, as mentioned, it's brilliantly written. Speaking of the Dreamlands, there's one Dreamlands-set scenario, a favorite of mine, which often gets ignored because of its problems: In a City of Bells and Towers. It's heavily influenced by the writing of Thomas Ligotti, in particular his short story The Journal of J.D. Drapeau, which is quoted more than once in the original scenario; the Drapeau references are interesting, but irrelevant to the plot. That said, the biggest problem with the original's mechanical: it reduces the climax to a series of die rolls, failure being punished severely. The new version is much less punishing, and the Drapeau references are expunged, replaced with musings more relevant to the campaign. Internally the layout and artwork is a massive improvement on the original. The 1991 edition had to make do with black & white drawings, but the new version goes all-out to impress with new art, reprints of some of the best of the old art, period photographs, extra maps ... God, those maps. Whoever had the idea of reproducing the building schematics and train diagrams as architectural drawings deserves a medal. It just looks so much better, and adds that extra touch of authenticity. Should you get this? First answer me this question: do you already have the 1991 boxed set, and can't stand 7th Edition? I mean really can't stand, as in loathe, as in would rather bathe your eyes in acid than look upon its heresy? Then maybe you should think really carefully about this, but I put it to you: is your hatred of the new system so virulent that you're willing to pass up on tons of cool new stuff as well as improved versions of the old? At least consider getting the .pdf version rather than the box set. The .pdfs are on sale now, though the quoted price seems remarkably high; Chaosium has confirmed this is the intended price tag. What if you don't have the original? Then provided you're willing to swallow that price tag, this campaign's for you. Don't get me wrong: there's a lot of great scenarios here, plus the fancy die-cut Simalcrum and all the extra goodies. You will spend months if not years playing through it. It probably is worth that kind of money. I just look back at when I started playing and ask myself, if this thing had cost over a hundred bucks when it first came out, would I have bought it? Maybe. It's definitely a luxury item. I will say this: if you do pony up for the box set, you won't regret your purchase. One final word: it's on preorder right now. Chaosium's spent a lot of time bringing this to market, and there have been a couple blown delivery dates. The next due date is very soon, at time of writing. If prompt delivery is a concern, wait till the preorder period is over and the thing's actually on sale, then make a purchase. That way you know when it'll turn up on your doorstep, ready and eager to put the fear of Cthulhu into your unsuspecting players.